Hohulin Fence even keeps the highways and byways safe with our guard rail products. 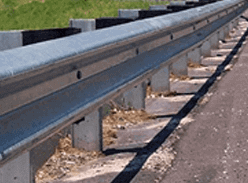 These highly effective highway safety products are galvanized continuously in the manufacturing process that provides high quality, consistent thickness; zinc coated steel sheets that can be formed into different types of guardrails or custom profiles. Contact Hohulin today to see if this is the right product for your roadway, whether it is a busy interstate or a quiet country thoroughfare.